TexMUN is Central Texas Model UN’s official travelling team, competing at numerous collegiate conferences around the continent. 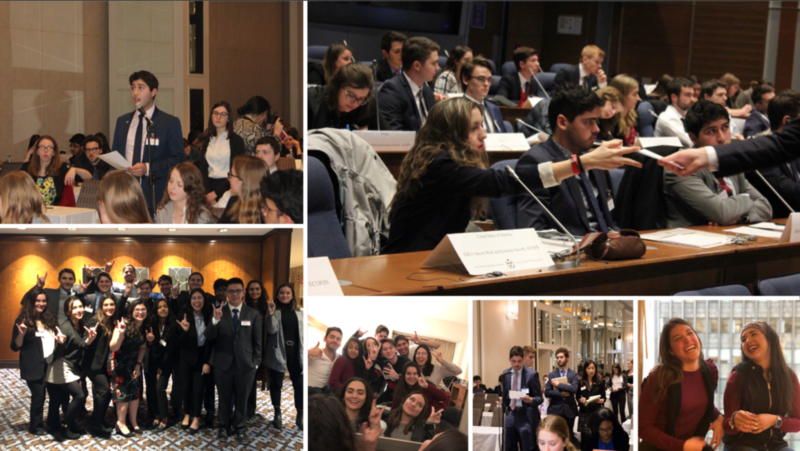 We have represented the University of Texas at McMUN in Montreal, UNCMUNC in Chapel Hill, LAMUN in Los Angeles, as well as various regional tournaments. As of Spring 2019, TexMUN is also ranked among the Top 50 “Outstanding” MUN Delegations on the collegiate circuit, encompassing teams from around the continent. This also makes TexMUN the highest ranking Texas school on the circuit. During the Spring 2019 Semester, we will be competing at LAMUN in Los Angeles and FCMUN in Mount Holyoke. Applications have closed for Spring, but stay tuned for updates on future try-out and application dates by liking us on Facebook! TexMUN is administered by the Captain, Zachary Lucio-Rivera (L), and the Chargée d’Affaires, Doha Chahine (R).